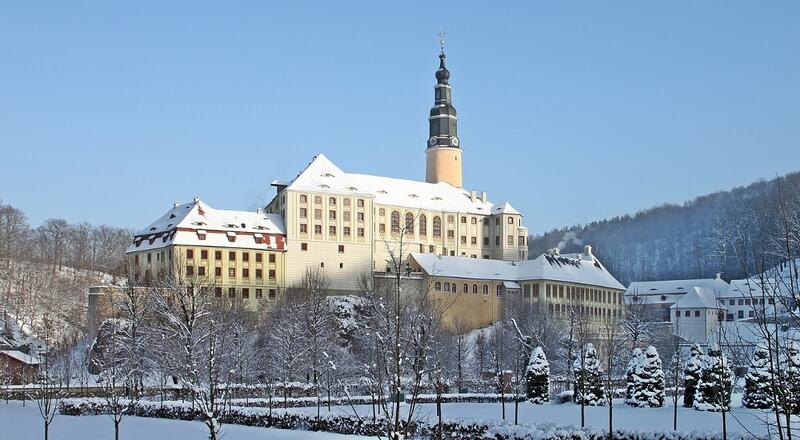 The presently visible ensemble of Schloss Weesenstein is the product of centuries of development and rebuilding. The castle is thus a mix of styles, ranging from Gothic architecture to Classical architecture. The main portal, built in 1575, is considered one of the most valuable Renaissance portals in Saxony, The Schloss is built on a rock with storeys descending from the central, medieval round tower (with its 18th-century spire). In total, the castle has eight storeys and contains around 200 rooms in total.